With the development of a new recreational park, citizens can now enjoy a new open space which also adapts the neighborhood to future climate threats. 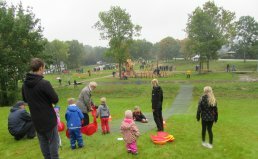 Ringsted Municipality has established a city park in collaboration with Ringsted Supply, protecting an area vulnerable to flooding and allowing citizens to enjoy the lungs of the city. The project in Benløse is designed to be capable of delaying the flow of rainwater from a nearby residential area during a 1-in- 100-year flood before discharging the water to Benløse stream. Rainwater is delayed by and stored in eight newly built reservoirs in the park, then transported through open grooves. To ensure the water, which runs through the park, the forest and the meadow, is clean, it is treated by a water filtration plant before distribution. Three of the reservoirs are designed with dual function. In dry periods, for example, one reservoir can be used as a football field, while another functions as a natural biotope and “insectarium” for kids. The remaining five reservoirs are turned into meadows which enhance insect biodiversity. Citizens’ experience of the spaces and feedback have been key to the municipality. Locals were consulted on the design of the project to ensure that it meets their needs and expectations. In addition, locals have received regular updates about the project via the municipality website. Nearby daycare centers have also been actively involved and, among others, helped set up the insectarium. At the park’s opening, children and adults alike were excited to explore the green and recreational areas. Green areas have a positive impact on our mental and physical health. With a playground, walking paths, outdoor exercise machines and quiet nooks, the park helps boost healthy lifestyles in Benløse. The park is designed to protect two daycare centers, a shopping mall and ten apartment blocks against a 1-in-100-year flood, as long as the rainwater on these properties is diverted to the public system. The park's design caters not only to citizens, but also to insects and birds. In addition to the biotope reservoir, animals and insects can enjoy a water channel and wetland area. Ringsted municipality is located on the island of Zealand in eastern Denmark.